We’re hearing more and more people, from all over the world, talking about the Trans-Pacific Partnership Agreement (TPPA), and they are all saying the same thing: trade deals that are negotiated in secret, that do not give citizens any say over the content, that have the potential to have huge effect on the lives of ordinary people should stop right now. We at NZNO agree; we have a right to know what’s going on. The TPPA is a free trade agreement that is being negotiated between the United States and ten other Asian and Pacific Rim countries. 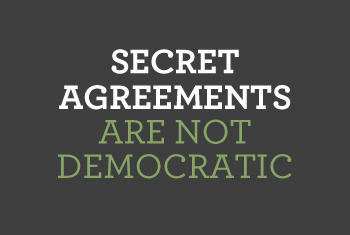 The negotiations are being held in secret, so what we do know comes from leaked documents. The things we are finding out are extremely worrying. Big business seems to be in control. And when big businesses have more rights than States and Governments, you know that it is the citizens of those countries who will bear the brunt. Pharmac is New Zealand’s purchasing agency for medicines. It buys all the drugs for the country, in bulk and generic versions where possible, to give tax payers the best value for money. It’s a very clever system and as a result we end up paying much less for medicines and medical equipment than other countries like Australia and the US. The agreement will give big pharmaceutical companies the ability to patent their products for longer, meaning that cheap “off-patent” generic drugs will not be available for years, and possibly decades. They will also be able to make tiny tweaks to existing drugs and then patent them again. The agreement will also put into place “transparency” provisions which will interfere with the successful commercial strategies that PHARMAC uses to get medicines at an affordable price. New Zealanders need access to affordable medicines. We are a small country; Pharmac uses our bargaining power very effectively and must be protected from provisions in the TPPA which reduce its effectiveness. Unfortunately, this isn’t the only provision in the TPPA that will affect the health of New Zealanders and their safety. There’s more on the It’s our future website and NZNO will blog about this important issue again. Tags: free trade, Pharmac, public health, secret deals, TPPA, transparency | Permalink.